Creating a reference allows you to connect a part of your text with another part of the text or with a picture or graphic. 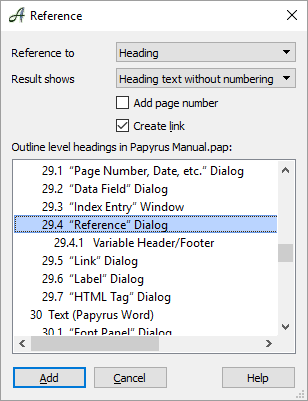 The reference is the part of the text you refer to, which can be a heading, picture, or an area of text within your Papyrus document. References are visible in the text by a little flag, carrying an equal sign. References also work like a hyperlink; by double-clicking on a reference, you can jump to the referenced part of your text. “Back” in the context menu will take you back to where you started. To add a reference or to edit one that already exists, you can use the “Reference” dialog found under the “Insert” menu. Right-clicking on a reference will bring up the context menu, from which you can access the “Reference” dialog as well. 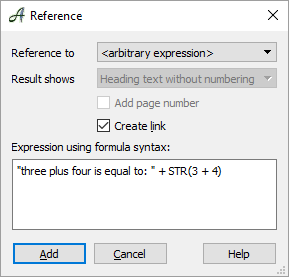 Under “Reference to” → “arbitrary expression,” you also have the option to enter a formula instead of words. This means you can enter a calculation field right in the middle of your text by using a reference. You can also enter the front matter placeholders, which you have entered under document properties (Title, Author, etc.). For more information, see the “Front Matter” Dialog. References can also be used to create Variable Headers and Footers within a master page.